2017 Alumnae Panhellenic Scholarship Recipients – Alumnae Panhellenic of Tallahassee, Inc. 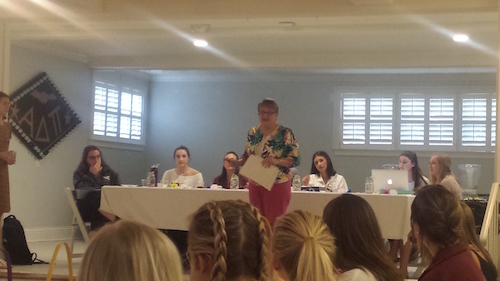 The Alumnae Panhellenic of Tallahassee presented the 2017 Scholarships to the recipients at the FSU college Panhellenic meeting, April 4. Funds for these scholarships were raised at the annual Scholarship Luncheon and Silent Auction. The Kenshalo award is for Greek women with a GPA of 3.2 who exemplify leadership, scholarship and citizenship. 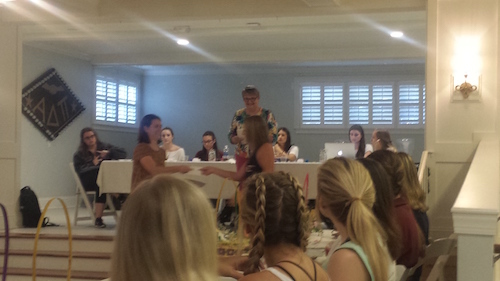 Kelsie Patton, APT Treasurer hands out the scholarship checks.